Again kudos out to Marshall Sponder, who writes about Project Apollo, an effort led by ACNielsen to piece together the elements necessary to afford an offline or multi-channel marketer the same measurability to ROI that we operating primarily on the Internet have come to expect. The PPM resembles a pager. The passive device automatically records the wearer's exposure to any medium that has inserted an inaudible code into its audio programming using an Arbitron PPM encoder. When a unique, inaudible code is detected, the PPM registers, records and time-stamps the signal. At day's end, the media history is downloaded by a docking station that simultaneously recharges the PPM unit. Portability ensures that all exposures register, from conventional broadcast media to in-store vehicles, from entertainment venues to streaming media, from video games to the Internet. household hub collects information from the docking station and transmits the data via phone lines overnight. 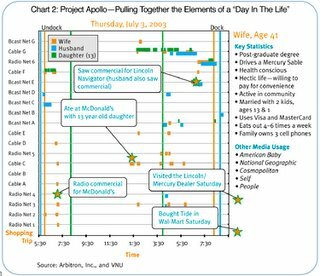 Looking at the description of PPM on ACNielsen's Project Apollo website, it really starts to sound realistic to expect that in the next 5-10 years we'll have the type of measurability for TV, radio, print, outdoor and in-store media that we've come to expect from paid search. Apollo, when will we have lift-off?